Size - 31cl / 310ml. Quantity - 1 Glass. Two new Absolut glasses 12 drip mats and a rubber bar runner. Size - 44cl / 440ml. Quantity - 2 Glasses. A bit about BrewerianaUK. Size - 31cl / 310ml. Quantity - 2 Glasses. 44cl / 440ml each. Very nice glasses. Approx 11cm tall and 6.7cm across the top. nd Class to 1. Size - 44cl / 440ml. Quantity - 1 Glass. 2 tumblers used but in good condition. Stylish Absolut Vodka Tall Shot Glasses x 4. Quality heavy base glasses with sleek Black print. Very stylish to add to your cocktail bar, perfect for entertaining & parties. HAS ABSOLUT ON FRONT OF THE GLASS. 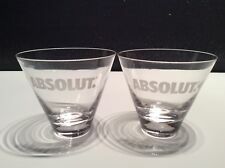 These unusual Absolut Vodka long drink glasses are frosted at the bottom and include the Absolut logo running down the glass. There are 4cl and 2cl lines on the rear. They are manufactured by Rastal. ABSOLUT VODKA - 3 COCKTAIL GLASSES 3 stylish Absolut Vodka cocktail glasses. Etched lettering to sides. Unusual set for cocktails. Thanks for viewing. Please visit our eBay shop for lots of similar items. Two short stem martini glasses with a blue shallow dimple on the base. Lovely to serve your favourite style of martini in. Absolut Vodka is one of Swedens finest exports enjoyed the world over. Stylish design with the unmistakable Absolut logo. Dishwasher safe. An Absolut product distributed by Petrolscooter. UNITED KINGDOM. 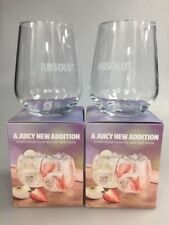 Absolut Twin Shot Glasses new without box! But still in very good condition condition! Has lovely yellow and blue bottoms .. measures approx 5 inches ..
1 GLASS TUMBLER. FOR MORE GLASSES. OR FOR THE COLLECTOR. 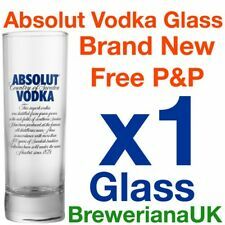 Absolut Vodka Glass & 2 x Beer Mats! NEW Cocktails Martini Party Great Gift! 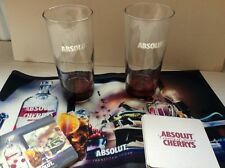 Stylish Absolut Vodka Glass & 2 x Mats. WITH GOLD RIM. AND GOLD LOGO TO FRONT. NEW AND UNUSED. Absolut Highball Glass. Condition is New. Dispatched with Royal Mail 2nd Class. "ABSOLUT" VODKA GLASSES, IN A. EACH STANDS APPROX 3.5"(9cm) TALL. 2 EXCELLENT & SUPERB ETCHED. ABSOLUT VODKA. TAPERED GLASS. WITH A BRIGHT BLUE STEM. IN AN EXCELLENT, CLEAN, BRIGHT CONDITION. NEW AND UNUSED. AS WE TAKE GREAT PRIDE IN ENSURING THAT YOU. Box of 6 Absolut. Rock glasses 30ml. On trade so not normally available in store. ABSOLUT VODKA GLASS Condition is New. Dispatched with Royal Mail 2nd Class. Absolut vodka glass. New and unused so in perfect condition. Six absolut vodka glasses and shot glasses. Condition is New. Dispatched with Royal Mail 2nd Class. 25 ABSOLUT vodka Shot Glasses . Condition is New. Dispatched with Royal Mail 2nd Class. 50 Absolut Vodka Shot Glasses - NEW - 20p each. Any number, up to 50, may be purchased. Collection only. STIRRERS / MIXER STICKS. SET OF TEN. Quantity: 1 Absolut Vodka Long Drink Cocktail Glass. Quantity: 1 Absolut Vodka Blue Martini Cocktail Glass. Product: Absolut Vodka Limited Edtition Glass. Quantity: 1 Limited Edition Absolut Vodka Glass.